If you’re in the process of planning your next international break or are searching for some travel inspiration, be sure to check out these 5 great reasons to tour Vietnam. From fine food through to the nation’s rich history, you’re sure to find a side of this amazing country that piques your interest! Incorporating fresh local ingredients and influences from China, France and beyond, Vietnamese cuisine is vibrant and full of flavour. Generally less spicy than the cuisine of its neighbouring countries, Vietnamese food tends to be light, fresh and fragrant. Making use of fresh meats, vegetables and herbs, many dishes may seem quite simple in terms of their elements, but certainly feature a rich flavour profile. Spanning from hearty soups to cool salads best suited to warmer weather, Vietnamese cuisine is diverse and nothing short of delicious. Some iconic dishes popular both in Vietnam and abroad include bánh mì (a baguette typically filled with meat, mayonnaise, pate and a variety of salad vegetables), pho (a fragrant noodle soup typically served with beef or chicken) and Vietnamese coffee (served with condensed milk), but there are countless other dishes waiting to be sampled. If you are wanting to try something a little different, consider bánh xèo (a savoury pancake stuffed with a variety of ingredients), bún bò Huế (a beef and rice noodle soup with a predominant lemongrass flavour) or bánh cuốn (steamed sheets of rice batter filled with minced pork, wood ear mushroom and shallots). Look for popular eateries frequented by locals for the best quality, and be sure to head beyond busy tourist areas for the most authentic fare. Pho, a Vietnamese noodle soup. Beyond its delectable cuisine, one of Vietnam’s greatest drawcards is its incredible natural beauty. From spectacular rural landscapes and beautiful beaches to ancient caves and incredible waterways, it’s easy to see why visitors from across the globe flock to Vietnam’s shores to be surrounded by sights such as Hạ Long Bay and the islands of Nha Trang. Situated in northeast Vietnam, the turquoise waters of Hạ Long Bay are peppered with more than a thousand limestone islets. Weathered by the wind and water, some islets have been hollowed out over time, leaving behind a number of intriguing grottoes just waiting to be explored. Popular with visitors from across the globe, cruises operate regularly in the bay, making it easy to experience the beauty of the area and see the fascinating structures up close. Surrounded by 19 untouched islets, Nha Trang in southern Vietnam is the perfect place to enjoy a spot of island hopping. Providing the perfect conditions for fishing, snorkelling, swimming and more, the islands all offer something a little different, making for a great day out. 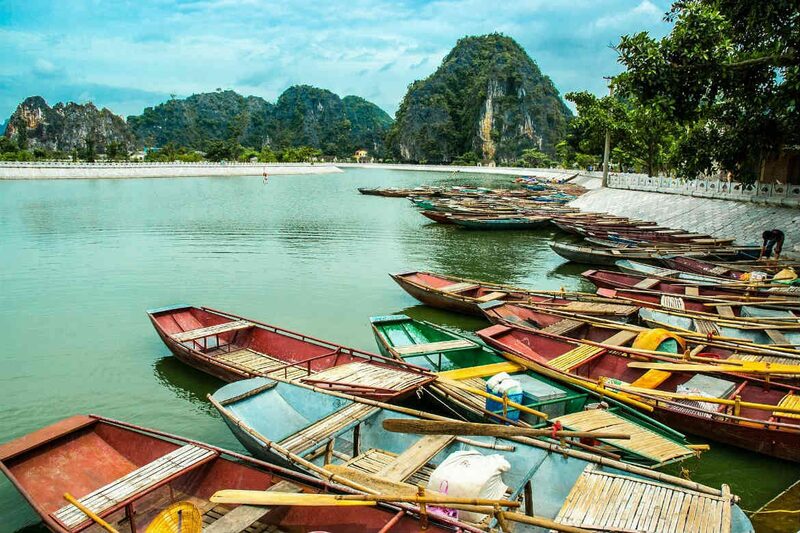 Spend the day on the water, get active or kick back and relax beneath the warm Vietnamese sun. Although Vietnam has continued to progress and change over time, reminders of the tumultuous periods that shaped the country, including colonisation by China and France and the Vietnam War, can still be found in the memorials, historic sites and museums scattered throughout its cities, towns and villages. A great way to get to know how and why its current incarnation came to be, you’ll find plenty of opportunities to learn about Vietnam’s history as you explore the country. In Hanoi you’ll find fine examples of ornate French colonial, with grand structures, such as the Hanoi Opera House (Nhà hát lớn Hà Nội), conspicuously positioned within vibrant Vietnamese streetscapes, while well-preserved Ancient Town of Hội An showcases a blend of wooden Chinese shophouses, historic temples and iconic Vietnamese tube houses. One of the most influential events to affect modern Vietnam, the Vietnam War is remembered with countless museums and memorials across the country. Filled with memorabilia, military vehicles and equipment used during the conflict, museums such as Ho Chi Minh City’s War Remnants Museum offer a sobering glimpse into the horrors that occurred during the world’s first widely televised conflict. Important historic sites, including the Củ Chi tunnels (a labyrinth of underground tunnels used by the Viet Cong), also provide a sense of the conditions faced by both sides during the long-running conflict. Hanoi Opera House, Hanoi, Vietnam. Image Credit: Adam Jones / CC by SA 3.0. Compared to New Zealand, the cost of living in Vietnam is quite low, meaning that travelling throughout the country is much more affordable than other popular holiday destinations, such as Europe, Australia or the United States. Quality inner-city accommodation is quite a lot cheaper than equivalents in other countries, while a whole main meal of fresh street food can be found for just a few dollars. With some planning, transport costs can also be quite low, with buses, trains and internal flights allowing you to see more of the country for less. Exploring Vietnam as the member of a tour group, where the transportation is already pre-arranged, can help to offer some extra peace of mind and remove the stress of planning each leg of your journey if you are wanting to travel extensively. Although expenses are often low across Vietnam, luxury accommodation and fine dining restaurants are also available, if it is more to your preference. Vietnamese Dong. Image Credit: Amy Wardlaw / CC by 2.0. One of the best parts of travelling to any part of the world is the opportunity to get to know the local people. Warm, friendly and accommodating, the people of Vietnam certainly do help to make a visit to the Southeast Asian nation one to remember. Whether it’s allowing you to learn about their way of life, welcoming you into their home or sharing delicacies filled with authentic Vietnamese flavours, embracing the opportunity to interact with the country’s locals can see you enjoy experiences that you may not otherwise have the chance to. If you are planning to visit Vietnam, consider taking some time before you leave home to learn a few common greetings and phrases that will help make communicating with locals a little easier. You don’t need to be completely proficient, but the locals will definitely appreciate your efforts. Ready to discover what makes Vietnam so special? Browse through the latest Vietnam tours available from Webjet Exclusives today!